Created in the early 1960s, the Touring car class quickly became very popular with manufacturers and fans alike. It was the perfect opportunity for manufacturers to prove their worth on the track, and for fans to see the cars they drove to the track compete in anger. In the first years the eligible cars were popular four door saloons like the Alfa Romeo Giulia and the Ford Cortina, but with the ever changing rules they were replaced by two door cars like the Alfa Romeo GTA and BMW 2002. What remained was the minimum production requirement of 1000 cars for homologation purposes. By the turn of the decade Alfa Romeo was the dominant force in the European Touring Car Campionship (ETCC), but in the background a rivalry grew between Ford and BMW that would headline the championship in the years to come. First things first, what was considered a touring car in those years? Porsche tried to get their 911 homologated, but that was rejected on the grounds of having too little backseat space. Similarly cramped coupes like the Alfa Romeo Giulia GTA or BMW 2800 CS were accepted though, although it must be said that Porsche did not make things easier for themselves to also have the 911 homologated as a GT. Basically if a car had enough space to seat four people and was built in sufficient numbers it was eligible. To regulate the wide variety of cars, each displacement bracket had a minimum weight so the smaller cars had a chance of winning against the big ones. From season to season changes to the classes and homologation requirements were made. One of the most important ones was the acceptance of extensive modifications after a part's production run of just 100. Right around the birth of Touring car racing, BMW turned a new corner away from the large and expensive V8 engined saloons to smaller and most importantly more affordable four and six cylinder engined cars. Of course the cars were by no means cheap, but it did open a whole new market for the German manufacturer. The new cars engines were also much more suited to motorsport and from 1964 the Munich based manufacturer was present in the ETCC. Alongside the Touring car program, BMW also took up construction of bespoke racing engines for single seaters and sports prototypes. Finally there was also considerable backdoor support to local tuning company Alpina, who joined the works team in the ETCC. After the dismal state the company was in at the 1950s, it was quite remarkable that BMWs and BMW powered racers were winning races all over Europe not a decade later and there was more to come. Ford of Europe, located in Cologne, Germany, joined the ETCC in 1970 with the all new Capri coupe, which combined a very light construction with a powerful V6 engine. 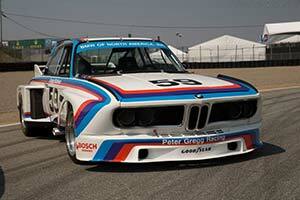 As an answer to the 'Mini-Mustang's' arrival, Alpina developed a racing version of the somewhat similar BMW 2800 CS. Breathing through three huge Weber Carburetors, the three litre six cylinder engines produced 300 bhp, but it was not enough to bring the heavy coupe up to pace with the Ford. Serious development work was needed to the extent that a new homologation was required. Weight was shaved off and the Webers replaced by a Kugelfischer Fuel Injection system boosting power to 335 bhp. Alpina was capable of a lot, but producing 1000 cars to pass the homologation requirements was a bit much. At this point BMW stepped in and took over the development and production from Alpina to seriously take on Ford.